Lonstreet at Cancon 2018. Battle 1: Norfolk. 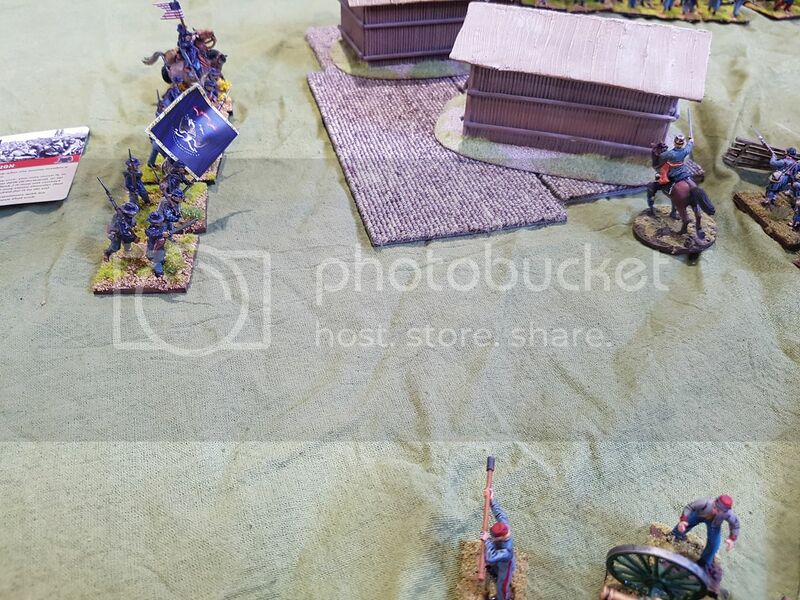 The Longstreet "tournament" was a very relaxed affair. More a pair up, move figures around the table and have fun. 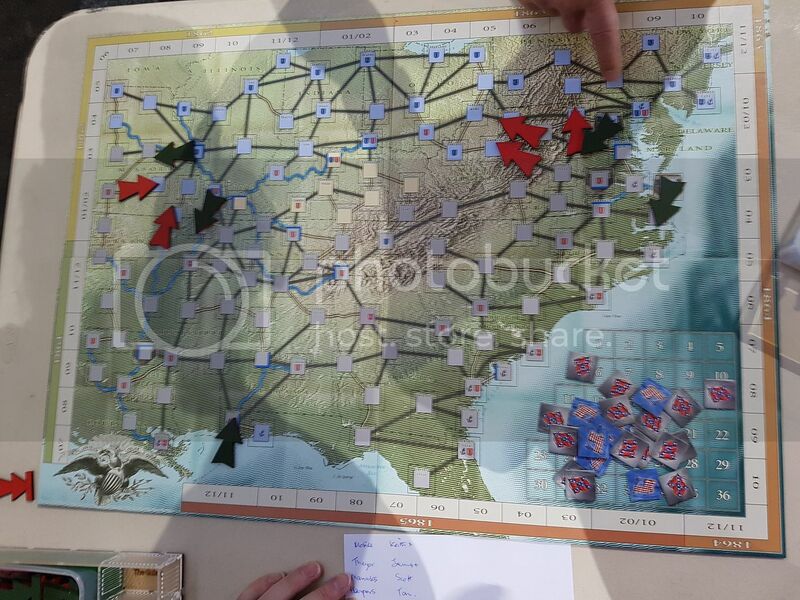 There were 20 players evenly split between Union and Confederate and the board game "A House Divided" was used to give the games so wider context. The idea being that each side started with 5 attack markers each and would alternately place these on the map to designate where the battles would take place. 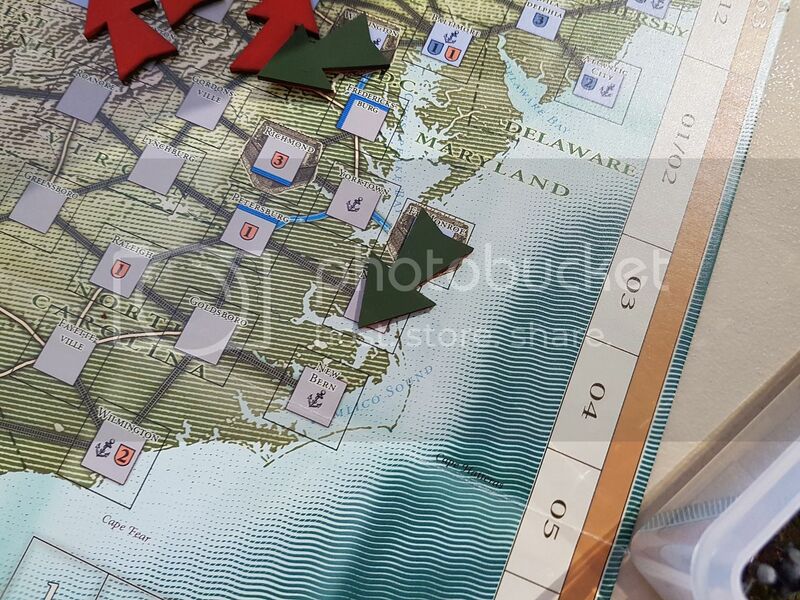 For each victory each side would earn an attack marker for the next round. All pretty simple and it seem to work really well. I drew "artillery" officer for my biography card. And with that Colonel Jean Georges Carnot and his 1st Louisana Brigade consisting of 1st Louisana Special Battalion, 1st Louisana Combined Militia Volunteers, 4th North Carolina, 2nd Lousiana Cavalry and Battery D of Washington Artillery of New Orleans, went to war. Intial battles. The Red arrows show Rebel attacks. Union Naval landing at Norfolk where I would be defending. My opponent Mark and I decided to just line 'em up and have a good old stoust without refering to any of the scenarios in the rule book. On my right flank I managed to get to the fence first and then sat there. Mark advanced and then sat there, just out of range. And that was how it was for most of the game, neither of us game to move. 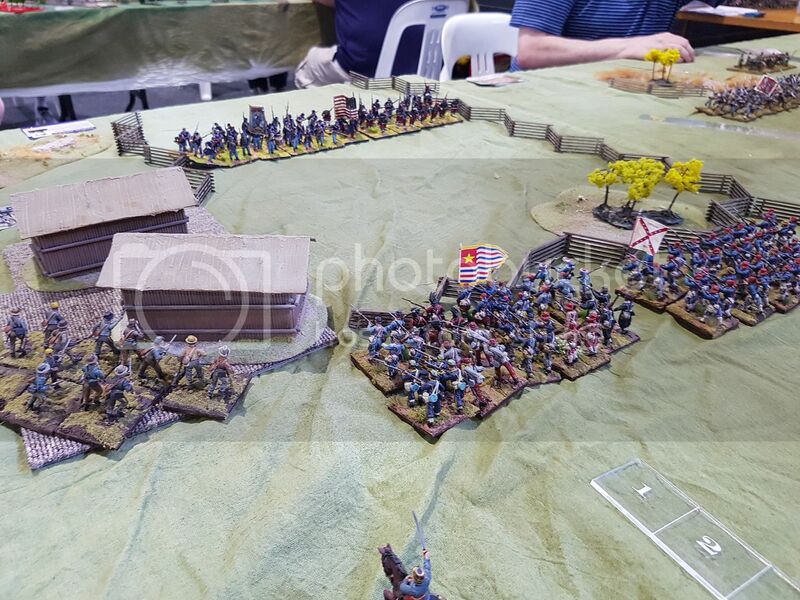 The guys on the left of shot are my dismounted cavalry. On the right I held the woods and was skirmishing quite well for a bit. Mark elected to swap a cavalry unit out and take an infantry regiment. This was a tournament option. Mark eventually charged in and managed to beat my boys back and drive them out of the woods. 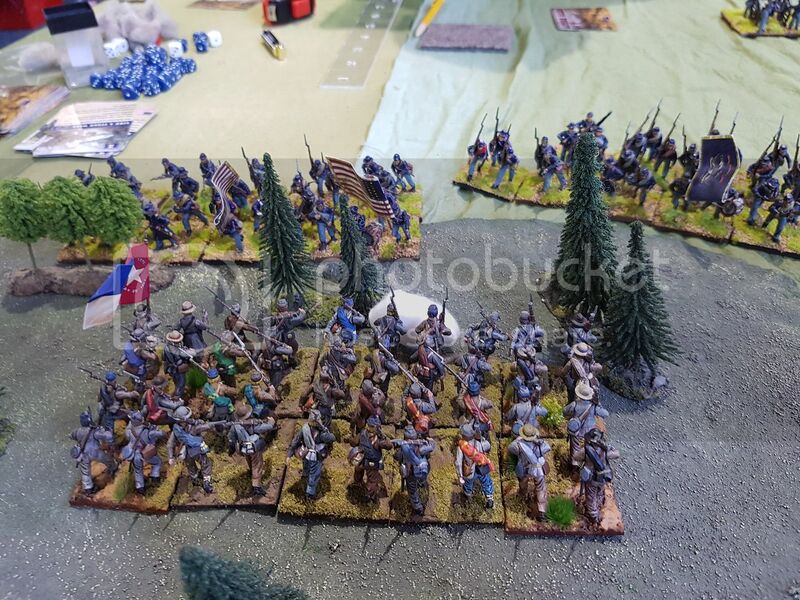 The cavalry fought well but under infantry and artillery fire they were eventually dispersed. My artillery did sterling work. With momentum slipping away I decided to cross the fence. However the first attack was beaten back with heavy lost bringing my army to break point. The cavalry was rebuilt to half strength as Cautious Veterans as was the North Carolinians. The Louisana infantry were brought back to full strength and remain Eager Recruits. 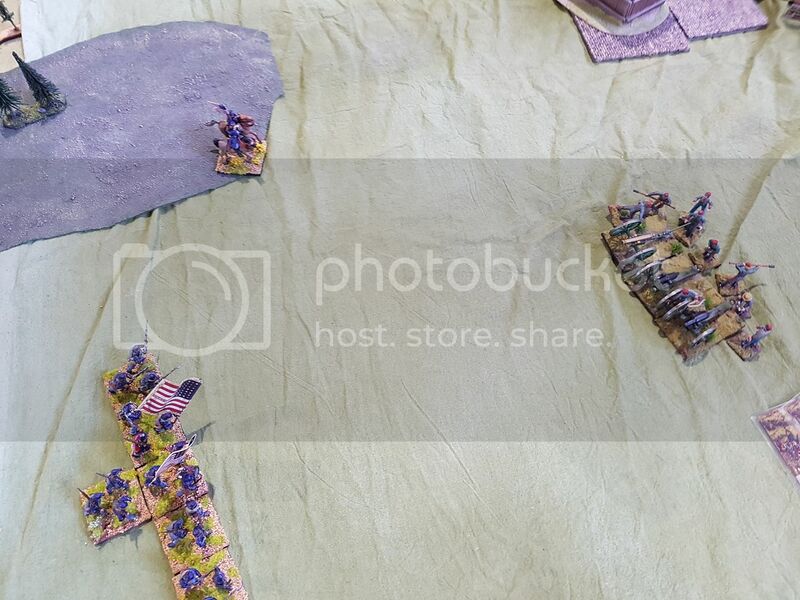 The Attrition phase was then bane of all of us at some point but my troops came through this first campaign strongly with few losses to illness or disertion. Re: Lonstreet at Cancon 2018. Battle 1: Norfolk. Thanks for posting this, your figures look great in action. BD luck for this round. 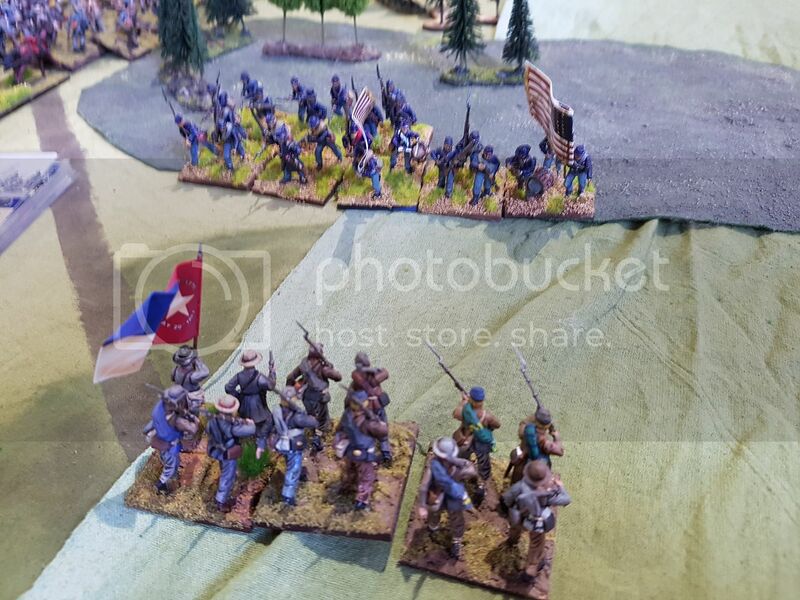 Well how'd you like the Longstreet rules? Also how'd you like the post game campaign phase (my favourite part!). Not sure if ths campaign rules were rejigged for Cancon but not sure how you could have a cautious unit after game one as they start eager and will become seasoned before cautious. .. There are a couple of quirks in the rules compared to others I have played but once you "forget" those bits it all goes rather well. having played a few games now I think I will be far more cautious with playing some cards and be more likely to hang on to some, accept higher losses and aim for bigger impacts. The campaign system is what first attracted me to the rules. 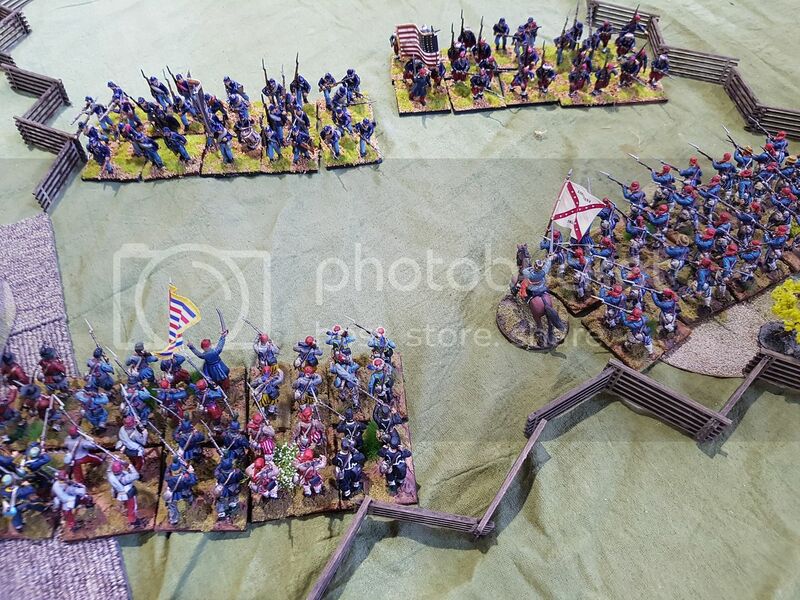 Gives a real feel for the constantly changing nature of an army on campaign without complex rules or book keeping. 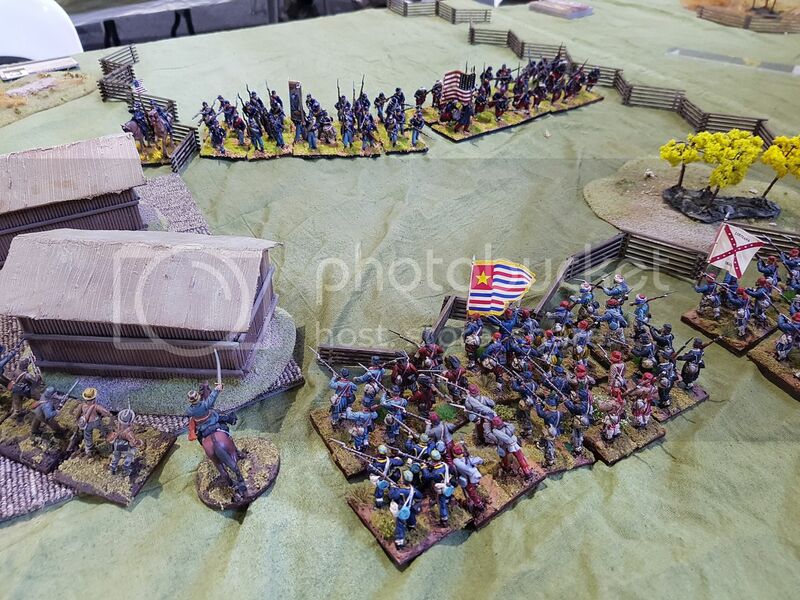 If you don't like the battle rules then you should look at the camapign system as I think it could be easily adapted. That might be a misunderstanding of the rules. Most of the players were relatively new so confusion sometimes reigned. 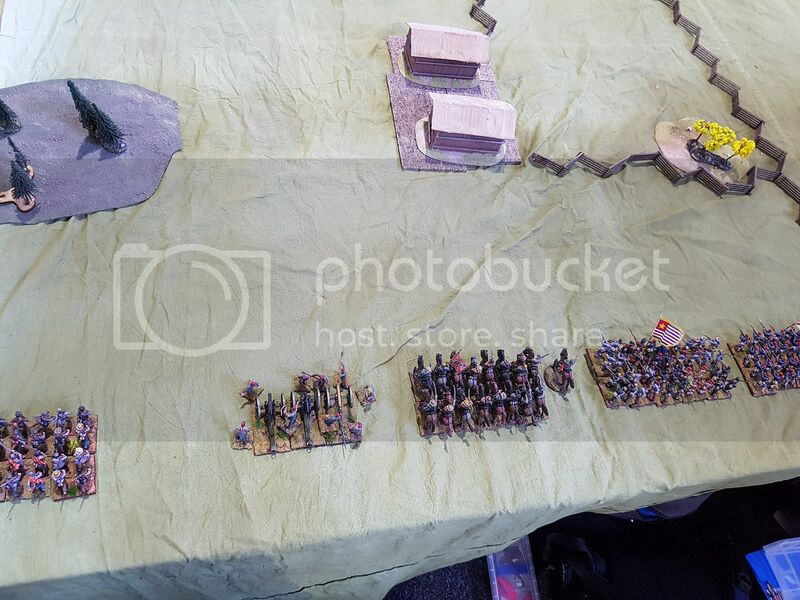 My cavalry started with 8 stands and was reduced to 1 in the final turn. So they drop one level for being reduce to 1 stand and then we rolled for elan vs losses (for each unit that suffered a loss in combat you roll a D6, if the result is equal or less than the number of stands lost the unit drops a level of elan). Once home from the weekend and having had some time to reread the rules it seems that would should not have done this and only applied 1 level drop. Live and learn. 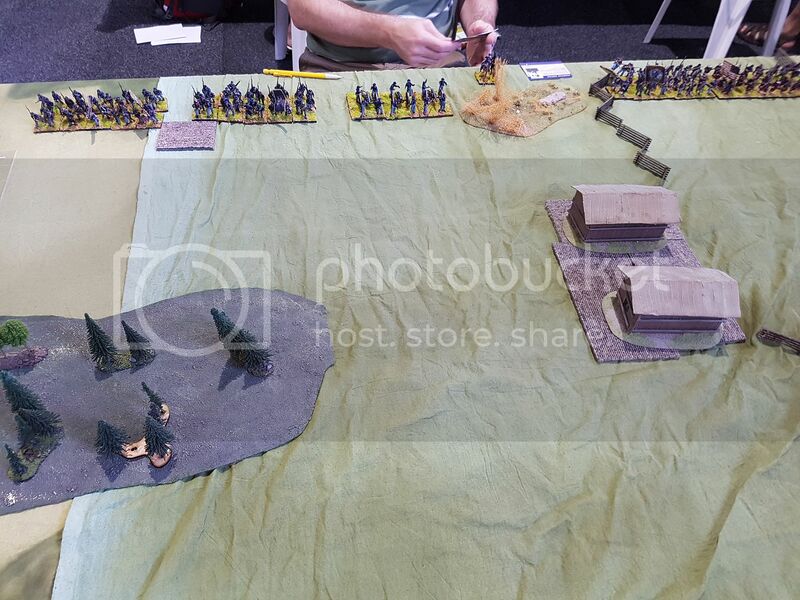 Yeah I think you short changed yourself on the Elan table there, bugger your cavalry was elimated in the last turn! The biggest quirk in the Rules is the pass move or charge phase no move and charge...still I’ve playtested some house rules for that works okay but we just stick to the originals for our games!